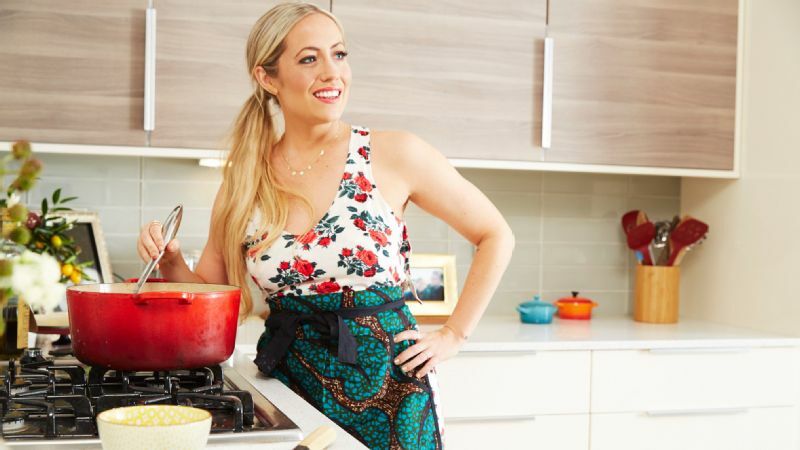 Kathryn Budig, author of "Aim True," offers three easy yoga poses to try while cooking. Ever have one of those days where you had every intention of working out, but the optimal window never presented itself? Fear not, there's still time! Instead of rolling into the kitchen defeated to make your dinner, try these three simple yoga moves while you cook. It might not be a full-blown workout, but it's still an opportunity to open your hips, release your hamstrings and shoulders and encourage better balance. "Tree pose" offers multifaceted benefits: It strengthens your standing leg, creates a gentle hip opener to aid in flexibility and can improve your balance. "Cow face arms" is a therapeutic way to stretch your shoulders and relieve the burden of hunching over a computer or steering wheel all day. Finally, "extended big toe" releases your hamstring and hips. This trio of poses is a playful way to exhale at the end of a stressful day. Find more yoga postures, as well as delicious recipes to try in correlation with or without the poses, in my new book, Aim True. Stand facing your objective at hand (prepping, stirring, etc.) and rotate your right hip open. Bend your right knee and grab your ankle, drawing the sole of your foot up onto your inner left thigh. Lightly press your foot into your thigh as you engage your standing quad. You can use this pose as a gentle hip opener or as a way to cultivate more balance. Take a clean wooden spoon or long stirring instrument in your right hand. Reach your arm straight up and then bend your elbow, dropping the spoon lengthwise down your back. Let your left arm hang next to your side with your palm facing back. Bend your elbow and wiggle your hand up your spine until you can grab the head of the spoon. Hold here for eight breaths and then switch hands. Face the kitchen counter and draw your right knee into your chest. Grab either the pinky edge of your foot/shoe or under your calf to place your right heel on the edge of the counter; place it in an area where you're not preparing food. Spin your heel forward and toes back to encourage the external rotation of your leg. Keep your standing leg straight and low, with your belly lightly lifting and engaged. Hold here as you prep food for about one minute each side. Kathryn Budig is an internationally celebrated yoga teacher and author known for her accessibility, humor and ability to empower her students through her message, "aim true." A Kansas native, she graduated from the University of Virginia with a double degree in English and Drama before moving to Los Angeles, where she trained under the tutelage of Maty Ezraty and Chuck Miller. With over a decade of experience in her field, she is a regular contributor to Women's Health magazine and Yoga Journal. She's an athlete in Under Armour's "I WILL WHAT I WANT" campaign, and the founder of her animal project, Poses for Paws. She is the creator of the Aim True Yoga DVD produced by Gaiam, author of "The Women's Health Big Book of Yoga," and her new book, "Aim True." Visit kathrynbudig.com for her regular blog and recipes and follow her on Facebook, Twitter and Instagram.